The NPRM proposes “to explicitly exclude oral history, journalism, biography, and historical scholarship activities that focus directly on the specific individuals about whom the information or biospecimens is collected.” Not listed is another scholarly discipline that also focuses on specific individuals: folklore. Why? Folklore projects can closely resemble oral history and journalism. Jeffrey Cooper of the WIRB-Copernicus Group alerts me to the example of the Library of Congress American Folklife Center’s Inauguration 2009 Sermons and Orations Project, which collected “audio and video recordings of sermons and orations that comment on the significance of the inauguration of 2009.” These were not oral history interviews, but the effort “to enhance the nation’s historical record and preserve the voices of religious leaders and other orators for researchers and scholars of the future” sounds a lot like many oral history projects, and presumably the sermons and orations will be credited to the speakers, much like oral history interviews. Folklorists have historically studied marginalized or disempowered populations: minorities, women, workers, and rural people. Over our century and a half of disciplinary existence, we have learned to stop treating people as generic members of a social category or as passive “tradition‐bearers.” Individuals typically want credit for their knowledge, experience, and creativity. It would be absurd to strip individual identifiers from a study of Plácido Domingo’s vocal technique or an intellectual history of the counterinsurgency strategy in the Iraq war. It is equally nonsensical to strip such identifiers from a study of gospel singers or grassroots activists: no intellectual sense can be made of their practices without the surrounding context. More importantly, to demand the suppression of individual identities denies these people the dignity and respect conferred on more powerful individuals. Given this claim, the AFS erred in framing its ANPRM comment as an endorsement of the American Anthropological Association’s comment. While the AAA’s statement was bold and principled, it did come from a group that traditionally obscures the identities of its informants by providing them with pseudonyms and blending details from several people into composites, thus treating them more “as generic members of a social category” than as individuals. If the AFS is serious about studying individuals, it should claim closer kinship to journalism, biography, and history than to anthropology. Even without a clearer comment from the AFS, the authors of the NPRM could have figured this out. The sole reference to folklore in the document is a reference to this blog, in which I noted a 2010 Smithsonian Institution policy that combined journalism, and the “collection(s) of oral histories and cultural expressions (e.g., stories, songs, customs, and traditions and accounts thereof) to document a specific historical event or the experience of individuals without intent to draw statistically or quantitatively-based conclusions or generalizations” as activities that did not require IRB review. In other words, the NPRM cites, indirectly, a document equating folklore to journalism and history, but fails to grant folklore the same treatment as those other fields. This could be corrected with the addition of a single word to the final rule: insert “folklore” after “biography” in § ____.101(b)(ii). Folklorists who focus on specific individuals deserve the same exclusion granted to historians, biographers, and journalists. 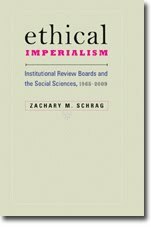 Schrag Reviews Klitzman, Ethics Police? NPRM Proposes Freedom for Historians!